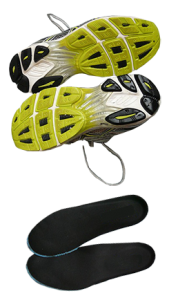 We provide true quality custom orthotics utilizing the method recognized and accepted by insurance companies. Ideally, prescription custom orthotics are precisely “cast” using a very specialized technique. The physiotherapist adjusts your foot into a special position called “sub-talar joint neutral” while it is suspended in the air, and then creates a slippercast. The physiotherapist will prescribe adjustments to the cast using precise calculations to help correct any deficiencies in your foot structure.